Just because we are camping, doesn’t mean Natalia is eternally rubbing sticks together to make fire and provide for her family, caveman-style. I mean, it is a vacation, isn’t it? And a vacation to me means a judicious blend of rustic roughing-it at the campsite and delightful forays into civilization, where other people — preferably terrific local chefs — bring me my food and provide me with cloth napkins in exchange for my credit card. So while camping at Hither Hills State Park last week we forayed to fishbar, where executive chef Jennifer Meadows (click here to learn about her and her experience on Chopped) serves up local goodness in clean and inventive ways. 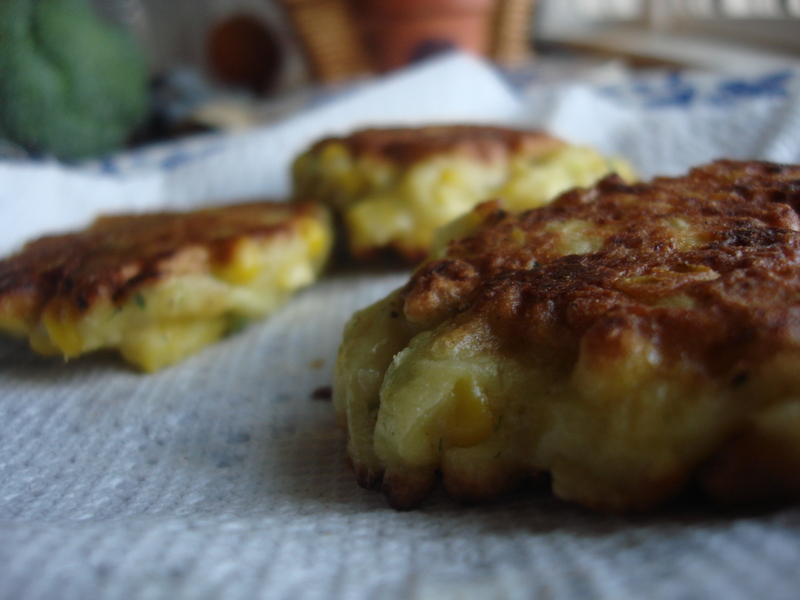 When we arrived –late of course — my parents — who always get a cottage of some sort nearby the campsite and were therefore bathed, fragrant, well-dressed and on-time — were already there, noshing on some corn fritters (because they knew it would be a while before we turned up). We all loved those fritters. 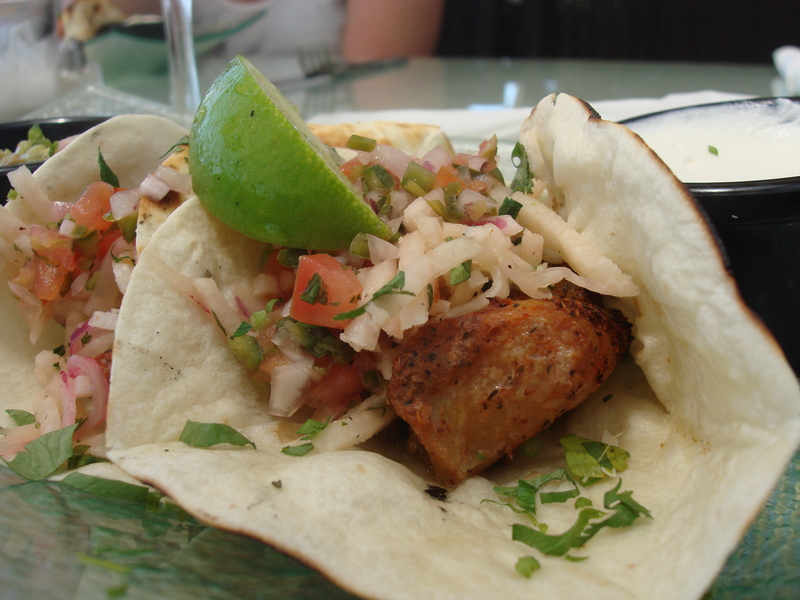 I wish I had a better photo of the fish tacos. They were love-ly! I could have probably asked for the recipe, but that would be too easy, wouldn’t it? 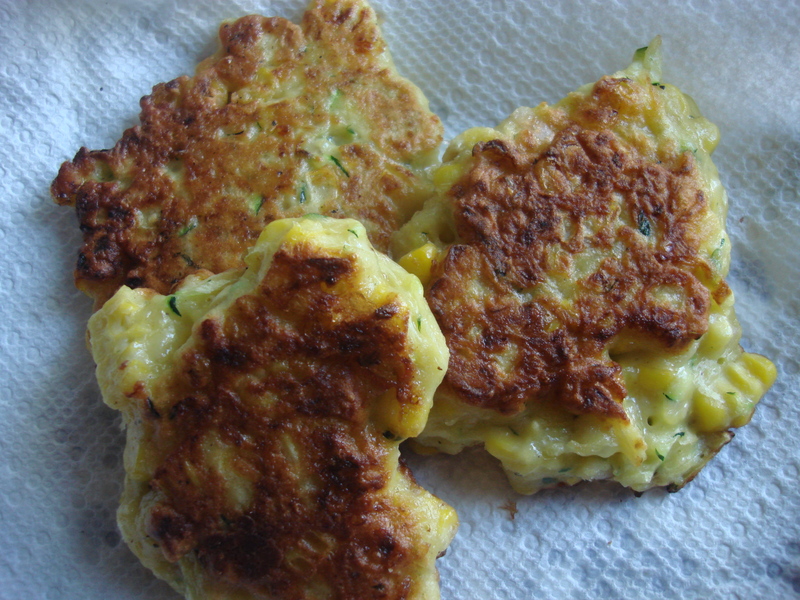 So here is my take on corn fritters — which helped use up a couple of cooked ears of corn and half a zucchini and a few other items in my fridge that needed gainful employment. Thanks very much to easy-breezy-lovely fishbar for a wonderful family meal out (kids feel welcome and it’s on a working marina where fisherman cleaning their catch are very amenable to showing little kids like mine how it’s all done) and for a lot of inspiration for future kitchen adventures. Next plan is to make a worthy sauce! fishbar’s was a cilantro chili one (I think), so I may try to work with that. Heat oil until loose at medium high in a frying pan. In a bowl, mix all remaining ingredients except water into a paste. Add water as needed to make it all stick together. Be prepared with paper towel on a plate. Drop generous tablespoons of batter into the hot pan. Flatten each round slightly. Lower heat to medium and cook for about three minutes on each side. Remove fritters to paper towel to dry and cool as you do each batch. Serve. Could not be easier and supplies a few of those needed serves of vegetables/day also! Your ‘fishbar’ seems a very pleasant alternative to a one-pan/pot campsite meal tho 😉 ! Indeed! I love dishes that are fun to eat and provide lots of nutritional bang…..thanks for the visit and the comments!